Witches of East End” stars Emmy award-winning Julia Ormond (Temple Grandin) as Joanna Beauchamp, an ageless mother trying to keep a supernatural secret from her daughters, Freya (Jenna Dewan-Tatum; Step Up) and Ingrid (Rachel Boston; (500) Days of Summer) so they can lead a normal life. But when Joanna’s estranged sister (Mädchen Amick; “Twin Peaks”) arrives to warn her of an evil entity out to destroy them all, Joanna is forced to reveal the truth about her family’s magical legacy. Co-starring Virginia Madsen (Sideways), Eric Winter (“Days of Our Lives”) and Daniel DiTomasso (“Beauty and the Beast”), this powerful and enchanting drama series will cast its spell on you! It seems that super natural shows are still popular even years later. With shows about Vampires and Wolves, it's only natural that there would be a show dedicated to Witches again since Charmed ended years ago. I was pretty excited when Witches of East End came out. This show is filled with lots of drama and action. This show kind of reminds me of that movie, Practical Magic in a way. Not that it's exactly like that, but magic isn't known to the daughters, Ingrid and Freya until their aunt arrives in town. Definitely a show that will catch your attention and a show that will have you wanted to watch more and more. The first season is now out on DVD. You can catch up on season one before season two comes out, Sunday, July 6th! Disclosure: All opinions are my own. 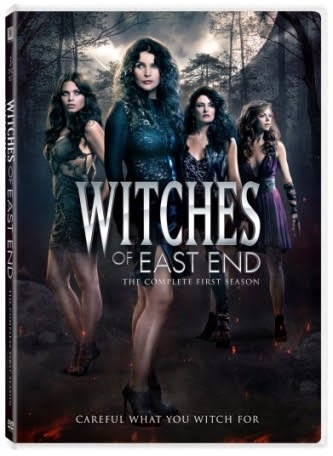 I received Witches of East End Season One on DVD at no cost for the purpose of this review. No other compensation was received.